I had a really busy Monday, and I'm glad that's over with. Look at this adorable hat - Miss Savannah is just too much. She'll be 7 months old next week! Amazing! Heather - I'm glad everyone is getting well - there are a lot of people with colds at work right now and one lady has a sick child at home and couldn't come in. I stopped at Target on the way home to pick up a few little things. $30 later I was on my way. Charlie and I both got home late last night so we missed most of 'Chuck'. We like that show! Sunday night we watched the premiere of 'Amazing Race' - that was good too. We are also following 'Two and a half men' this season - we never watched it until we started watching the reruns. More funny stuff! Hey! Gotta go! Have a nice Tuesday! Day 953 - Reruns already? 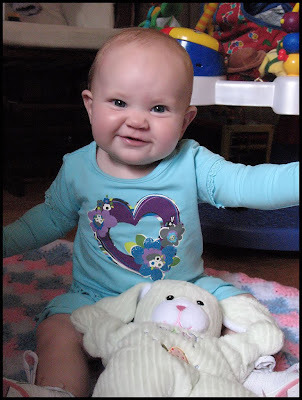 Here is another ADORABLE photo of Savannah, making ADORABLE little faces. Sweet! Really cute, Heather!! Thank you for keeping us 'ooo-ing and aaaah-ing' with pictures! Hey - I think I had a RERUN dream last night. I can't remember exactly what it was about. I felt like - Hey! I've seen this before, it must be legitimate (which it wasn't). Charlie and I went to see 'Eagle Eye' yesterday. We enjoyed it, it was entertaining, if rather unbelievable. Side note - did you know that Shia LaBeouf (who stars in Eagle Eye) is the son of the singer Saide? I think Cheryl and I saw her in concert years ago. Hey - it's 6am - gotta run! TTFN and have a nice Monday! Day 952 - How much is dirt? How is everyone in the NorthEast handling Hurricane Kyle? Inquring minds want to know! Marcia - are you asking what the price of dirt is by the bag or by the truckload? This is going to be short, because Charlie and I have decided to go to a matinee to see 'Eagle Eye' (or whatever the name is). We've already had breakfast, gone to swim, come back home, and had lunch. We might go out for dinner afterwards, it's just a week till Charlie's birthday. Day 951 - I love Saturday! Here's the cutest girl in the world, lookin' all retro in that 60's outfit. Charlie was up at 3:40am to go bow hunting for the first time this season. I decided to do laundry and write on the blog instead of lounging in bed. How do I generate SO much laundry anyway? It is a mystery. So - Wassup for your weekend? Charlie and I might go see 'Eagle Eye' tomorrow - it sounds kind of interesting. I booked an appointment to have my fingernails and toenails done next Friday at the nearby cosmetology school - I hope they do a good job! If they do, I'll be going back there, because they have all kinds of services for cheaper than dirt. A manicure, for example, is $8. TTFN and have a nice Saturday! Heather, I hope you're feeling better! Day 950 - Friday, Hooray! Heather and Savannah - get well! Nancy - Amazing Race starts this weekend if you watch it. We do. Survivor was a 2 hour show - I have always felt the first episode should be two hours so we were happy. I am sure it will be rebroadcast, but better look on the internet for when. Last night I reviewed my credit card bill. I saw a charge for $192 at Wal-mart. I thought 'I never spend $200 at one time in Wal-mart, that must be a mistake!' After a while I realized it was for LOBSTER, LOBSTER, LOBSTER! Day 949 - New Season of Survivor Starts tonight! First - get well wishes to Savannah who has her very first bad cold. Poor thing! Tonight is Chili night and Survivor Night! Nancy - remember to tape it! This is going to be really short because I spent the last 15 minutes reading email and redeeming my 'Thank You' credit card points for a $50 gas card. Unfortunately, that's only one tank, but I'll take it. If you only do that kind of thing once in a while, I had forgotten my username to log in, forgotten the password after I got the username, etc. Good grief. However, it was a fairly quick $50 - I'm not really complaining. Here is an 'outtake' photo from Newport, but it's a good lead in to the story I'm going to tell this morning. Note that all you really see is Savannahs HAT. First - let me say that I had a wonderful day yesterday working from home. I worked all day in my PJs and didn't get dressed till the afternoon when Charlie got home. How lazy is THAT? The story I want to tell is from the health club on Monday. I worked out at lunchtime because we had a 'Cracker Barrel' appointment for dinner that night. I was in the indoor pool (the outdoor is closed for painting this week), doing my water workout, and a middle aged guy entered the pool area to swim in one of the lap lanes. He had rather long hair that you could see sticking out from under his baseball cap. Kind of a scruffy looking guy, actually. He had on his swim trunks and a t-shirt. He walked down to the hot tub first and left his towel and shirt down there. He said 'Where I go, my hat goes, even in the pool'. My immediate thought 'He's going bald and won't let anyone see it. Definitely. There is NO other reason he would wear a hat in the INDOOR pool'. It's Tuesday- Monday was a busy day but it's over. Thank goodness. 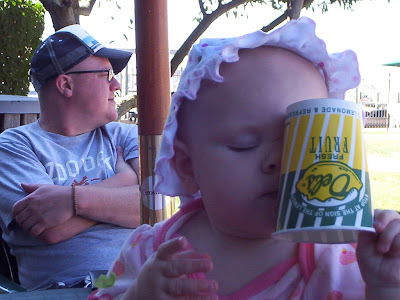 This photo of Savannah is hilarious, she hasn't quite figured out which direction a cup needs to be in, and that she can't drink out of her forehead. Adorable. Gas is still an issue here - about half the stations are out of gas, and if a station gets a delivery, it is gone the same day. Charlie and I passed a gas station that had a tanker truck on site. There weren't many cars around. In an hour and a half, we went by again (after our visit to Cracker Barrel). There were several cars at every pump, and more trying to get in. I am going to work from home today, but I still plan to get in a workout, so I won't save on gas. Day 946 - Happy Fall! Greetings, Bloggy Monday Morning Blah-gers! It might be Monday, but I'll cut it some slack because it's FALL, or AUTUMN if you prefer something a bit classier sounding. Have you seen a beautiful harvest moon yet? September's moon was exceptionally pretty, kind of yellowish and very big and bright. Remember - we all see the same moon, and I always say 'Hi Moon' to it when I see it. I don't know when that started, but I still do it. Well - thanks to Charlie making TWO different gas-scouting outings, my honda crv 4-door color white has most of a tank of gas. The two five gallon canisters-worth are in MY gas tank now, so I am ready for the work week. There were still plenty of stations with bags over all the pumps, but some stations had regular gas (no other choices). Thankfully, that is what my car needs. TTFN, happy 'Fall of the year', and have a nice Monday! Day 945 - I love Sundays too! As seen on a church sign down the street - 'Come in and get your faith lifted' - Get it? Faith lift? Charlie and I are going to go work out this morning at the health club - thankfully we were able to find some gas yesterday. If you don't know this - the Nashville area is in some kind of ridiculous and unnecessary gas shortage after hurricane Ike. Most stations are OUT completely including the gas stations at Sams Club, Costco, grocery stores, etc. The few stations that have any gas have 1-3 HOUR lines to get it. My personal opinion is that the responsible parties should be fined for this mess. Charlie bought gas in Chapel Hill, TN (they have a $30 limit per car). Chapel Hill is a very small town with very few drivers, evidently. We brought a 5 gallon gas can and put 5 gallons in it to take home for MY car, which was down to 1/8 of a tank. No gas station within 15 miles has any. Thank you, Charlie - for rescuing me! Hey! Tomorrow is the first day of Fall! I can't believe it! TTFN! Day 944 - I love Saturdays! You know the drill - I have to get 'up and atem' for my 8am water aerobics class. I was the only one at the pool yesterday afternoon, with the exception of a very bored lifeguard. I decided to ask him a question so he wouldn't be so bored. My reply 'Read the SIGN on the DOOR'. Day 943 - It's Friday already! I'm having trouble with Blogger this morning - this is my second attempt at writing the blog and using up a lot of time. I am going to try to publish this to see if it stops giving me error messages. Well, I got it to publish something. 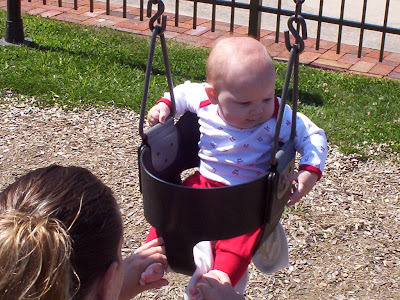 Here is Miss Savannah in Newport on a REAL swingset - she looks curious about it. 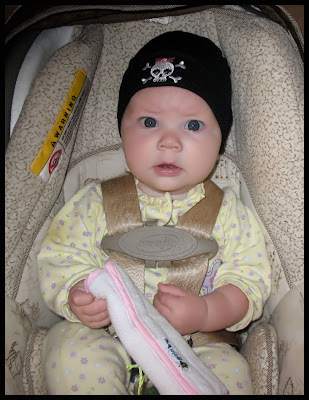 She has such a nice temperment, that little sweetie pie! (Heather may disagree after the last few nights). Gotta go - have a great Friday and a great weekend! TTFN! Day 942 - Heads UP! 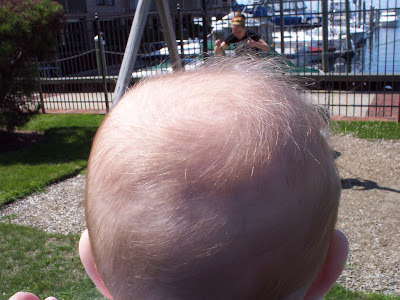 Here is another example of my picture taking prowess in Newport, getting a great shot of the back of Savannahs HEAD. Charlies new little grandson (and Mom and Dad) are doing fine and should go home from the hospital on Friday. Charlie is visiting again today, and we'll both go visit them at home this weekend and see how they are adjusting. By the way - summer clearance shopping is going very well for me this year. The stores seem to have HUGE discounts to free up space for the fall merchandise. For example, J.C. Penneys had a bunch of stuff marked down to $1.97 that was originally $40-$60! Day 941 - Congratulations, Charlie! Little Clark was born to Charlies daughter and son-in-law, weighing in at 8lbs, 6oz and 21.5 inches long. Clark was delivered via c-section. Everyone is doing fine, I'll go see the baby at the hospital tomorrow night. Here is darling Miss Savannah, chomping on her shoe. Deee-licious! Monday is over, thank goodness. Charlie and I went to Logans Roadhouse for dinner last night. Have you been to a restaurant that gives you a receipt with a phone number asking for feedback on your visit? If you take the survey, you get a few dollars off your next visit. We got $3 off our bill, and our receipt from last night has another survey on it, so I'll do that again! Anyway - the bill came in one of those big plastic folders, and was standing upright on the table next to me. I swatted at a fly and knocked it right off the table. It sailed over the side and landed on the peanut shell covered floor. I picked it up. Charlie said to me 'You looked cute, blushing when you knocked the bill off the table'. Have a nice Tuesday! TTFN! Instead of talking about (ahem), Monday, I haven't gotten around yet to telling you about our LOBSTER FEST at Buddy Joe's on Saturday! 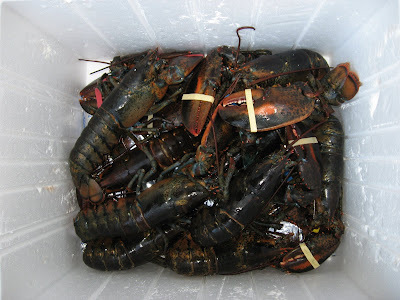 After hearing all our stories about Lobster during vacation, Buddy Joe decided he wanted some lobsters and proposed a lobster bake at his house. I agreed, at lightning speed. I shopped for them. Walmart had the best price, ($12.67/lb vs. $18.99 at the seafood shop). They ranged in size from a pound to just under 2 lbs. The smaller ones are the most tender, by the way! I picked them out myself, and the 'seafood guy' at Walmart (who happens to be from Florida) was EXTREMELY nice and kind. He packed them in a styrofoam cooler, put cold packs in the bottom, and didn't charge me extra for that. 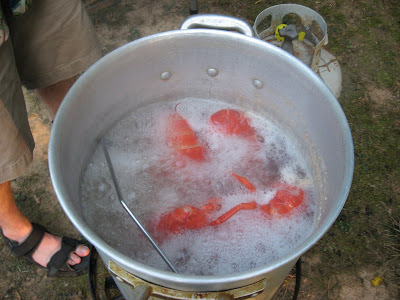 $192 later (which Joe indicates came from his economic stimulus tax rebate check), we had us a lobster boil. We cooked them in Joe's outdoor turkey fryer - see photos. We had homemade salsa and tortilla chips while they cooked. We had sausage, red potatoes, and cole slaw with the lobsters (2 each). We also had peanut butter, oatmeal, chocolate chip cookies for dessert! They were outstanding, and we had a wonderful time. A lobster fest in Tennessee - who would have thunk it? THANK YOU, JOE! Day 938 - Thou shalt not lie! in bed on Sunday Morning! We are leaving shortly to go swim, maybe more later. They didn't have the Aqua-rate' demo class yesterday - I got the date wrong. (at least I admit it). I did my own workout outside, and watched while a grown woman (who seemed nice but kind of a flake) do a really OCD kind of 'exercise' outside. The whole time I was swimming, she was walking the BORDER of the pool like a big balance beam, around and around and around. (She had workout clothes on, not a swimsuit). During that time, she put her hair up, took it down, put her hair up, took it down, talked to EVERYONE constantly including all the children, etc. Kind of strange but not excessively creepy. Do you ever meet people and immediately presume they are on a lot of prescription medication? She was one of those for sure. TTFN and have a great Saturday! Heather and Mike, have fun at the wedding! 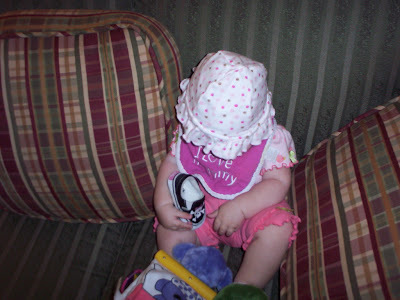 Here is another totally adorable photo of Savannah, taken in Newport. I had her propped up on the sofa between pillows for the 'photo opp'. When are the teeth arriving, Savannah? Inquiring bloggies want to know! I must say that my first week back at work has flown by. Really FLOWN. At 5pm today I am going to a 'demo' aqua class at the health club. It is something like 'water karate' or 'water martial arts'. THAT should be very interesting! Hiiiii - yaaaaa! If you care to post a comment today on what you were doing when you heard about the 911 attacks, feel free. That FREE-dom is why we appreciate our country so much, isn't it? I was at my former job when we heard about a plane flying into the Twin Towers in New York. I thought it was an incredibly stupid amateur pilot, not a terrorist attack. I was wrong, of course. I am still very proud of the passengers on UA flight 93 that took on the hijacker, losing their lives but likely saving many others with their courage. Remember them and countless others today who lost friends and loved ones. A nationwide moment of silence will occur at 8:46 a.m. ET — the exact time that terrorists slammed the first of two jetliners into the World Trade Center. The Pentagon was struck about an hour later. It's after 6 already and I was puttering around the house instead of writing the blog. This will be quick. A lady in another department put in a help desk ticket to my group. People do this when they are having trouble with a report or the system. She attached a screen shot (a picture) of her problem to the help desk ticket. We all had a good laugh when we opened the attachment, and it was a picture of her dog, not her computer screen! We had to go back and invite her to attach the correct picture to her help desk ticket. Day 933 - Made it through Monday! 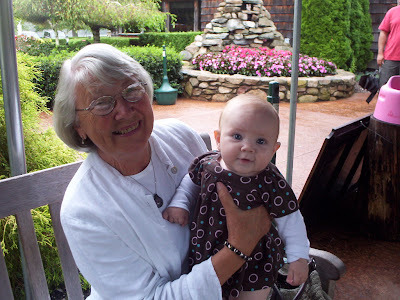 Todays photo is our darling Savannah with her darling great grandmother, Peggy. This picture was taken at the 'all you can eat lobster buffet' at the Nordic Lodge. We all (including Savannah, who ate oatmeal instead of lobster) had a wonderful time. Savannah didn't mind the throngs of people there, oohing and aaahing over her cuteness. Yes, I made it through my first day back at work with only a slight headache to show for it by the end of the day. Charlie and I went out for dinner to Logans Roadhouse with TY and SY and the headache was gone - smothered by a steak and baked sweet potato. Have a great Tuesday and TTFN! Day 932 - Monday morning - Oh No! I just had to edit the blog and correct 'Day 932', I had two 'Day 931's'. It's Monday, and back to work after two weeks and two days off. 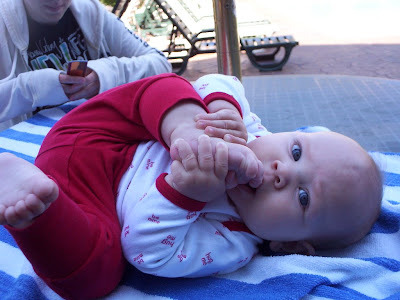 Maybe I'll put my foot in my mouth like Savannah and keep quiet today. 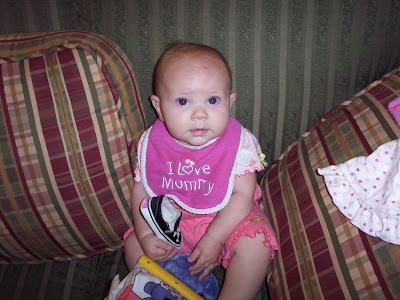 Speaking of Savannah, is this an adorable picture, or what?? The cuteness just never stops! By the way - I haven't gotten up at 5am since the day I left on vacation. I am woozy. Brain, please communicate the right messages for me today - and give me a break! Have a nice Monday, everyone! TTFN! As you know, there was no time today for bloggage. Charlie and I went to swim, then came home to watch a little Titans football, then went to see 'Mummy III'. I liked Journey to the Center of the earth more than Mummy III, in large part because they threw in so many effects in 'M3' it was almost ridiculous. Anyhow - Hello and it's back to work tomorrow! Day 930 - I'm Baaaack! Did you miss the blog, or am I doing this for no reason?? Charlie and I returned from vacation yesterday- and since it's Saturday morning, I need to leave for water aerobics class in a minute. 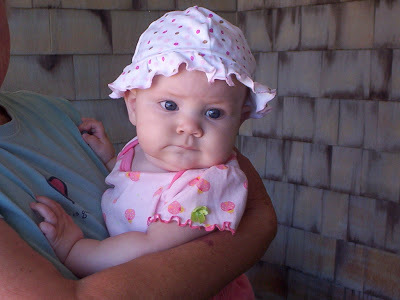 Here is a nice photo of Savannah (in great grandmothers arms) to keep you company today. 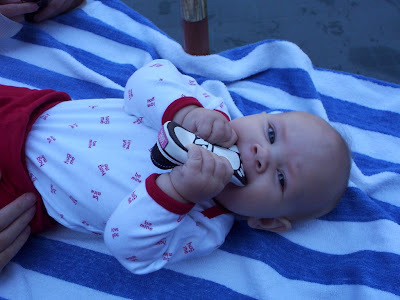 We had a great vacation and have lots of pictures to post on upcoming bloggage. Hang in there while I finish out the week on vacation, I'll be headed home on Friday. Happy September, and Happy Labor Day! I am happily enjoying vacation, so I won't be blogging much this week. Hope you're enjoying your holiday! TTFN!